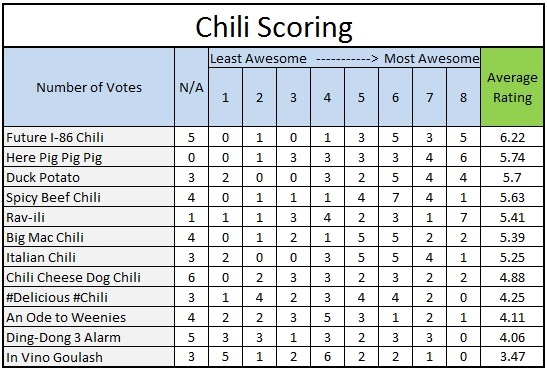 Click Here to Vote on Chili-Fest Day! When: Saturday, February 16th 2019, Doors open at 5:00pm; Consumption of mass quantities will start at 6:00pm. 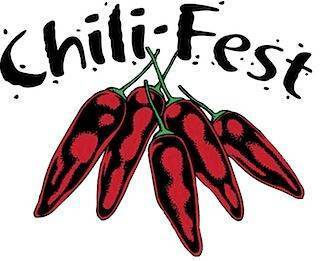 What: Chili-Fest is an annual gathering to celebrate the greatest food-stuff on Earth… Chili! Bring your favorite Chili, snack, side-dish, or dessert. You can win bragging rights or maybe even some prizes! 1St place; Tabitha becomes the first recipient of the Chili-Fest Trophy with her rendition of Breakfast Chili! Well Done! 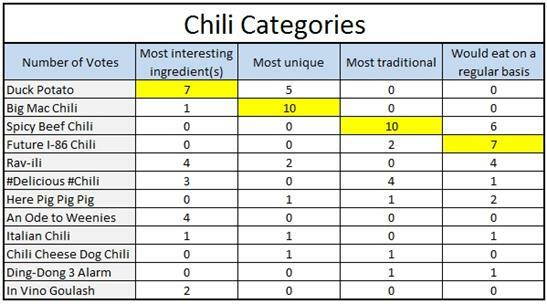 1St place; Richard Nichols cements his position at the top of the food chain with his tasty chili containing meats from 10 different animals. Congrats! Barton wins by a landslide with his chili/cornbread hybrid masterpiece. All of the entries were great and enjoyed by everyone. If you would like share your recipe, please e-mail it to me and I will post a link to it.